Once again, the Holiday season is quickly approaching, and you undoubtedly have a long list of gifts to buy. As you set out to find the perfect gifts, remember that you don’t have to break the bank for a meaningful gift. With that in mind, we’ve created a list of 10 great gift ideas that are all $10 or under! KC8201 Executive Key Chain | With a terrific price point, this sleek key chain is bound to be perceived well among its recipients. Customize the black gift box with your logo for an added boost of value! CM8414 Ceramic Mug | This over-sized ceramic mug was made for sipping a hot drink on a cold day! Fill it with specialty hot chocolate pouches, herbal tea bags, or even a bag of chocolate covered coffee beans. Finish it off with some cellophane and ribbon for a gift that’s a real sweet treat! CP3576 Ice Scraper Mitt | This gift idea is a real life-saver in colder climates. The Ice Scraper Mitt features a water-resistant glove with a fleece lined interior, and a 4.5″ ice scraper blade. Give the gift of a “helping hand” this season! TO5042 Holiday Wine Bag | This single bottle wine tote has a laminated metallic finish that adds some holiday sparkle. Pair it with a bottle of wine, and you’ve got a spirited holiday gift that will be appreciated! DA4816 Stainless Steel Travel Mug | It’s common to travel a significant amount during the holidays. Make those trips more comfortable with a warm beverage in this ultra hip stainless steel tumbler! PE8373 Touch Screen Stylus Pen | You will find tech items at the top of most wish lists this year. The Touch Screen Stylus is a budget-friendly tech accessory that is a true gift worth giving! CU4906 USB Car Charger | The ultimate stocking stuffer! This single port adapter charges almost any device that relies on USB power, including cell phones, laptops, tablets, and more. CO8397 Coaster Set | Sleek and contemporary, these black/grey coasters are a stylish, yet practical gift. Recipients can use them in the boardroom or around the home! DA8321 Double-Walled Tumbler with Candy Cane Straw Nothing says festive like candy-cane inspired straws. Fill these popular tumblers with candy or chocolate for an extra sweet treat! DA4739 Sticky Note Organizer | This handy product features a selection of sticky notes and sticky flags, as well as a two-year calendar. It’s a fantastic desktop piece, and it’s sure to keep you top of mind all year long! 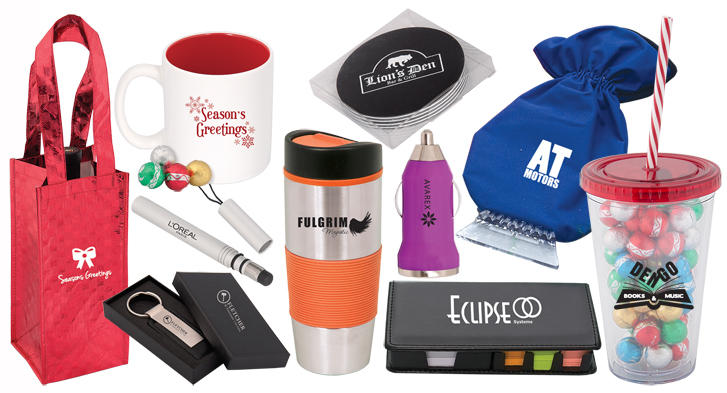 Each of these suggestions is available to be customized with your corporate logo. However, you may want to forgo your logo in favour of a holiday message, or a simple “thank you”. For more information about these products and other holiday gift ideas, contact your Sales Representative or reply directly to us below. Happy Holiday shopping! This entry was posted in Gift, Holiday Ideas and tagged client gifts, corporate gift, employee gifts, gifts under $10, holiday gifts, Memorable, promotional gifts, Thank you gift by Debco. Bookmark the permalink.